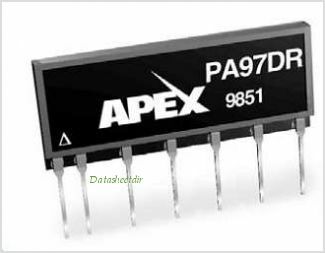 The PA97DR is a high voltage MOSFET operational ampliier designed as a low cost solution for driving continuous output currents up to 10mA and pulse currents to 15mA into capacitive loads. The safe operating area (SOA) has no second break- down limitations. The MOSFET output stage is biased class C for low quiescent current operation. External compensation provides lexibility in choosing bandwidth and slew rate for the application. APEXs SIP05 package uses a minimum of board space allowing for high density circuit boards. By Cirrus Logic, Inc. This is one package pinout of PA97,If you need more pinouts please download PA97's pdf datasheet. 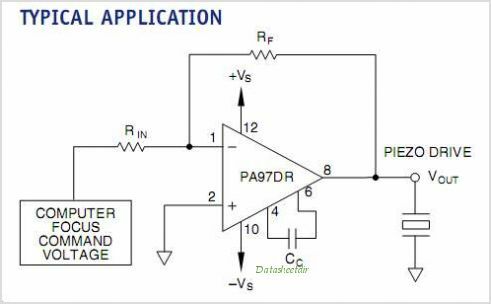 This is one application circuit of PA97,If you need more circuits,please download PA97's pdf datasheet.